If I was asked to recommend one book for the reader to be informed about the oceans of this planet and creatures that live in it, this is the book I would pick. It is absolutely packed full of facts with both colour and excellent black and white illustrations and diagrams. It is a comprehensive introduction and features the life below and above (sea birds) the waves. This well written reference book is extremely good value. The reader may be surprised to find a review of this reputable general encyclopaedia in a magazine on marine life. However, if you or your School Library can afford it, this is the best source of accurate information on oceans and marine life, and much more, including information of palaeontology and prehistoric reptiles. The text is the same as the book volumes. Britannica is viewed using Netscape Navigator 2.00 and the search methods and the ability to print out the text makes it an improvement than the books for finding out the information. The appearance on the screen is dramatically better than the cheap CD-ROM encyclopaedias. This is the future. There are major drawbacks, at present. The full gamut of black and white illustrations are not included and there are no colour photographs, sound or video sequences. Both English and American spellings are included and either can be chosen. It might be best to wait for the planned upgrades. 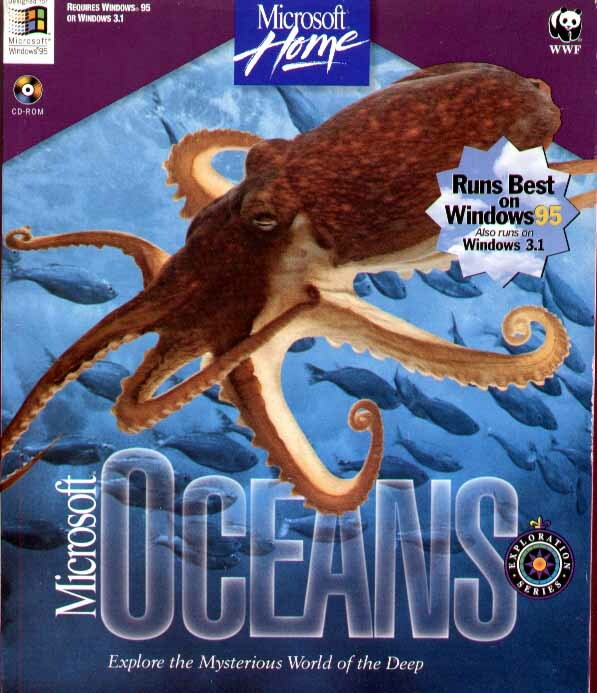 Meanwhile, Microsoft Encarta 97 also provides some good information on the oceans and marine life and the sequence and explanation on Tides is worth looking at and listening to. The Britannica search methods are brilliant and can use the Boolean system. Encarta 97 is just not in the same league. On some modern computers it is necessary to use Netscape Navigator 3.0 which can be downloaded from the web site. If your copy of Britannica comes with Netscape 2 and does not work properly, buy the December 1997 issue of INTERNET.WORKS if you want to download the later Netscape Communicator (the CD-ROM links to the site where Netscape 3 can be downloaded) (see below). This useful book is commonly seen in second-hand bookshops and is good value at about £5.00. The Times ATLAS & ENCYLOPAEDIA OF THE SEA is a recommended supplementary book. No ISBN available. interest stuff, the books reviewed in this issue are my preference. rather than an academic text. they buy. If they can answer every question correctly, they might get frustrated. better for information on marine invertebrates, as well as the explanation about the tides. Windows 3.1 or Windows 95. A Sound Card is necessary for the audio scenes.